Mornings are about to become so much better! Sip your coffee with the benefit of knowing you’re losing weight at the same time. 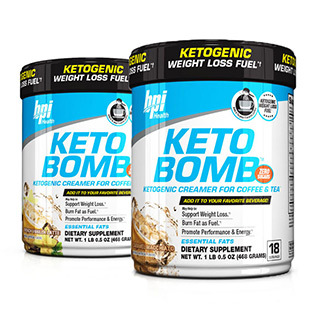 Keto Bomb, which comes in two wonderful flavors, has thermogenic technology to help you shed that unwanted weight. Along with weight loss, this product also includes a high-performance blend of electrolytes, which help maintain hydration and mineral levels which can lead to all around good health. Ships same business day, 3-5 day delivery time. FAST DELIVERY TIMEMost items ship for free in the USA and arrive in 3-5 days. 24 HOUR FULFILLMENT POLICYAll orders are processed and fulfilled within less than 24 hours. TOP QUALITY SELECTIONOur selection includes only the most trusted brands at the best prices. OUTSTANDING CUSTOMER SERVICEHave a question about your order, or a product that we sell? Our experienced, professional customer service team is here to answer any questions you have, and to ensure your complete satisfaction. PRIVATE LISTINGShipped discreetly in plain packaging. Return address does not contain product information. HASSLE-FREE INTERNATIONAL SHIPPINGHassle-free shopping for international customers (outside of the USA) and the lowest international shipping costs around.